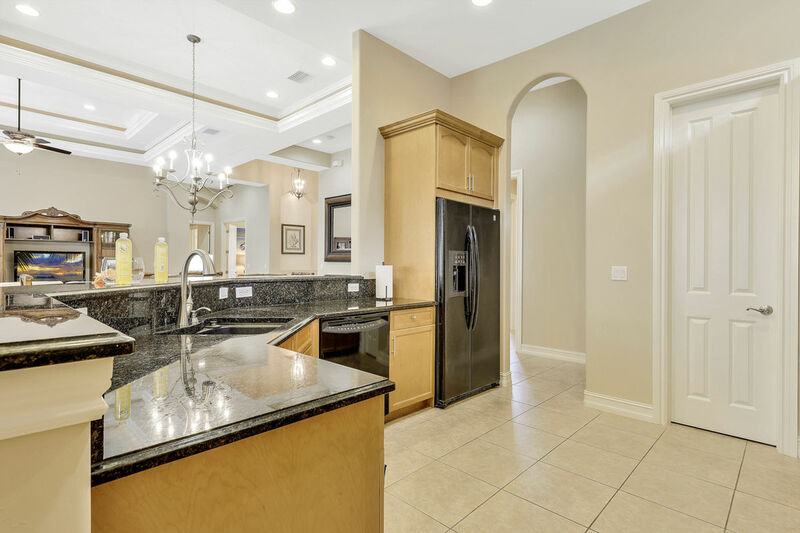 This spacious and inviting 4 bedroom/3 full bathroom home is located in one of the most highly sought after communities in Lely Resort, The Majors. With recently refreshed furniture and all new staging and decor by an interior designer, this home is ready to welcome its first guests! 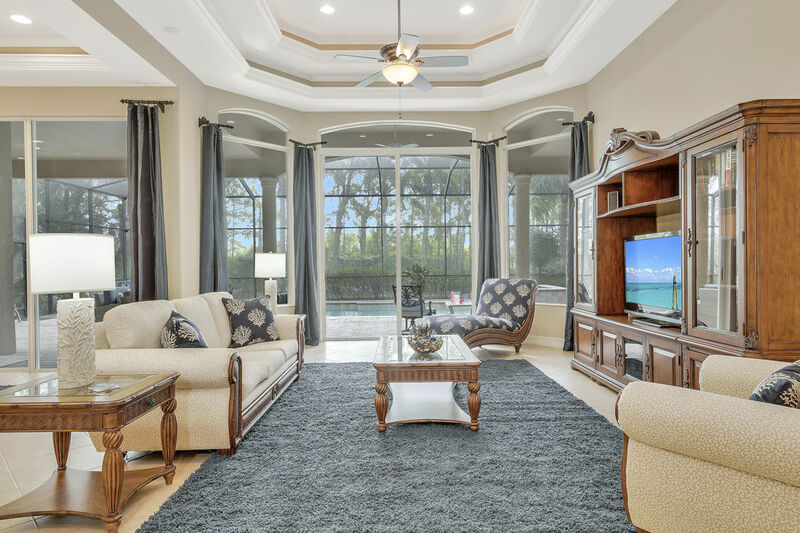 The preserve view allows for a very private setting while enjoying the very spacious and well furnished lanai with family and friends in the Florida sun. 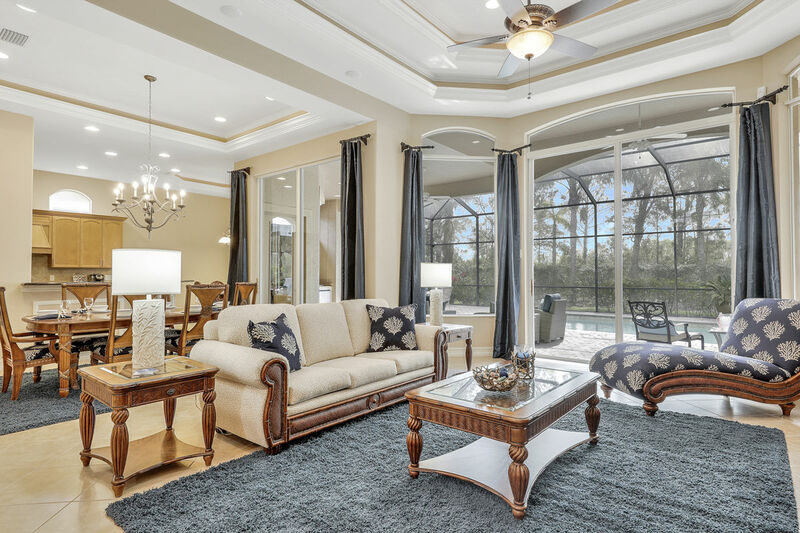 As you walk through the large front doors, you enter a large and welcoming great room. The great room features amazing vaulted ceilings and nicely appointed furniture and a large flat screen TV with DVD player – all of which may be overshadowed by the view of the beautiful lanai that is immediately visible through the wall of oversized patio doors that lead to a private pool/spa. A well-equipped kitchen – all new dinnerware, crystal, flatware, small kitchen appliances, etc – will accommodate the most discriminating chef. One can set a beautiful table for six (eight if you extend the table) at the dining table. The kitchen table will seat additional four. The outside lanai is an oasis of its own. 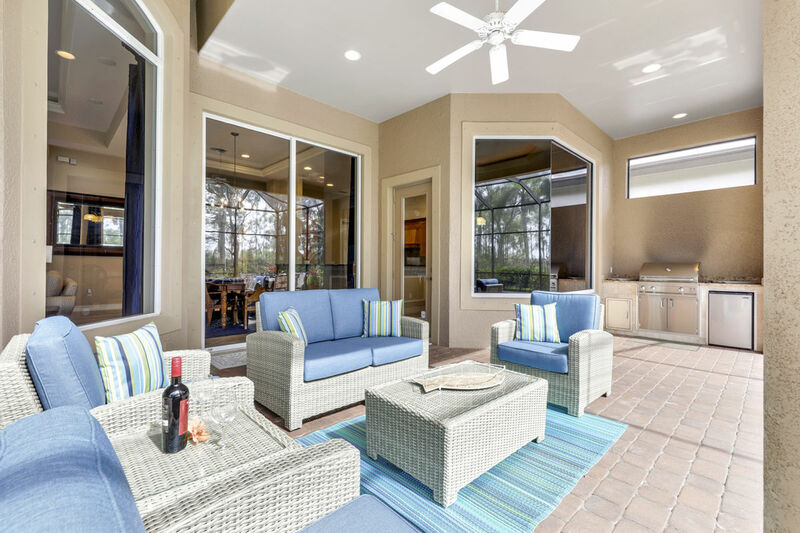 The lanai is approximately 1000 square feet of space with a southern exposure. 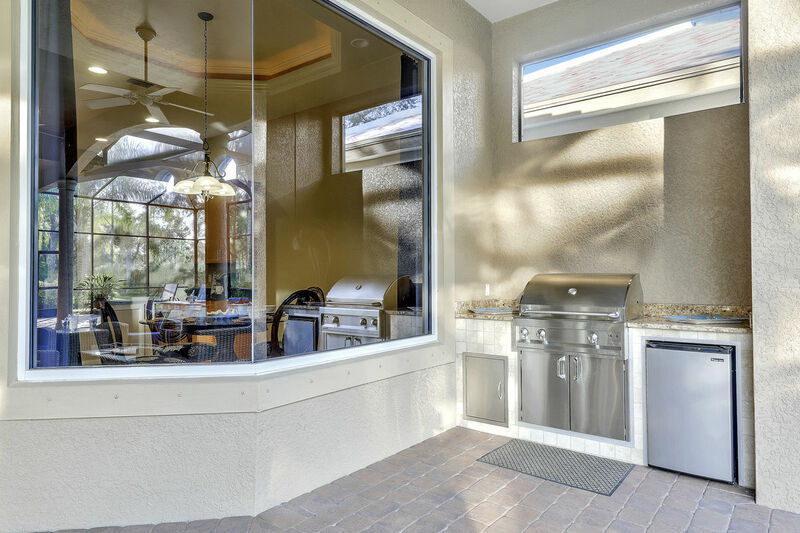 A pool/spa, outdoor kitchen, dining and reclining furniture await you in the magnificent Florida weather. 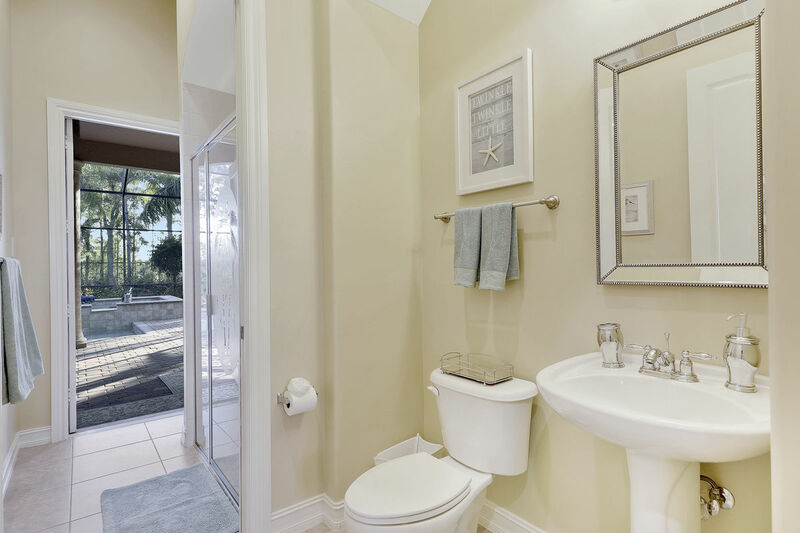 The home backs up to a preserve area, so it is a very private and quiet retreat. It is a wonderful entertaining space. 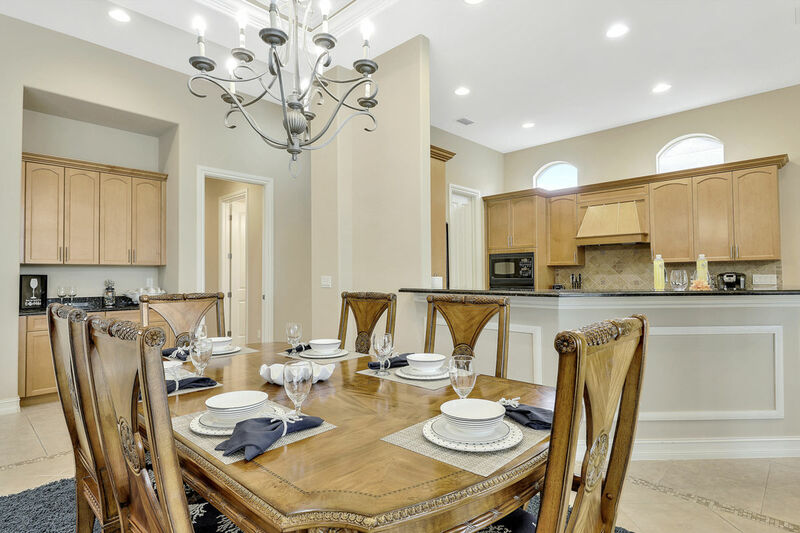 The high ceilings, crown molding, and oversized windows and doors of this open floor plan home continue into the four bedrooms and three bathrooms. The master suite boasts a king size bed on top of plush carpet and multiple oversize windows overlooking the pool area with a private bathroom ensuite. 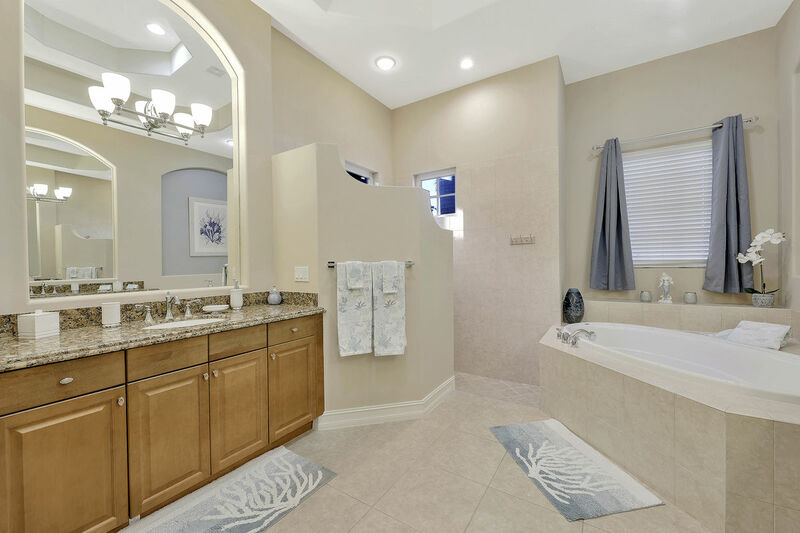 The master bath is also large – double sink and vanity, roman tub, and large walk in shower. 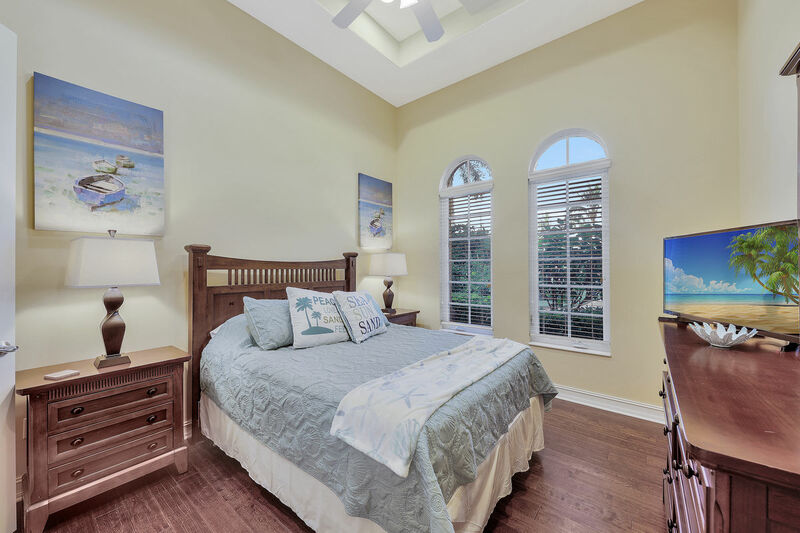 The second and third bedrooms are located on the opposite side of the home from the master suite to allow for maximum privacy. 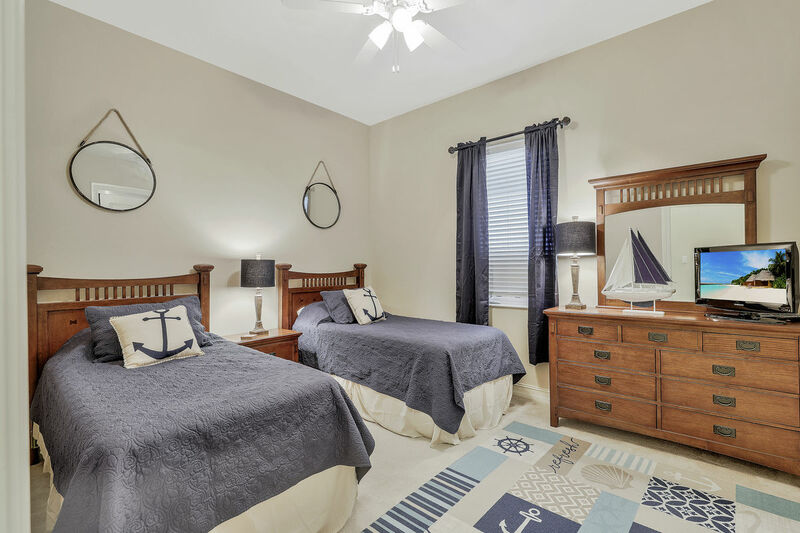 Another king bed is offered in the second bedroom along with a flat screen TV and you will find two twin beds in the third with a flat screen TV and a blue ray player. 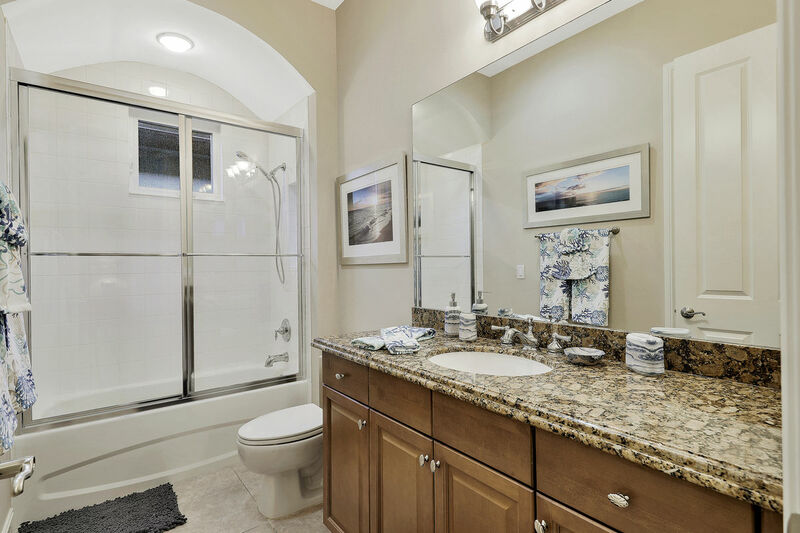 Between the second and third bedrooms is a full bathroom to be shared with a tub and shower combo. 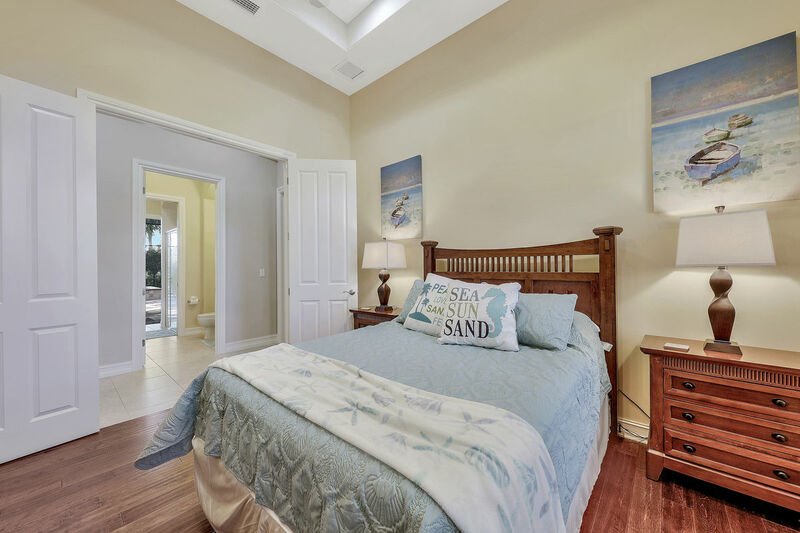 The fourth bedroom is converted from a den and now offers a queen bed and a flat TV and directly across the hall you will find the full bathroom with access to the pool and lanai area. 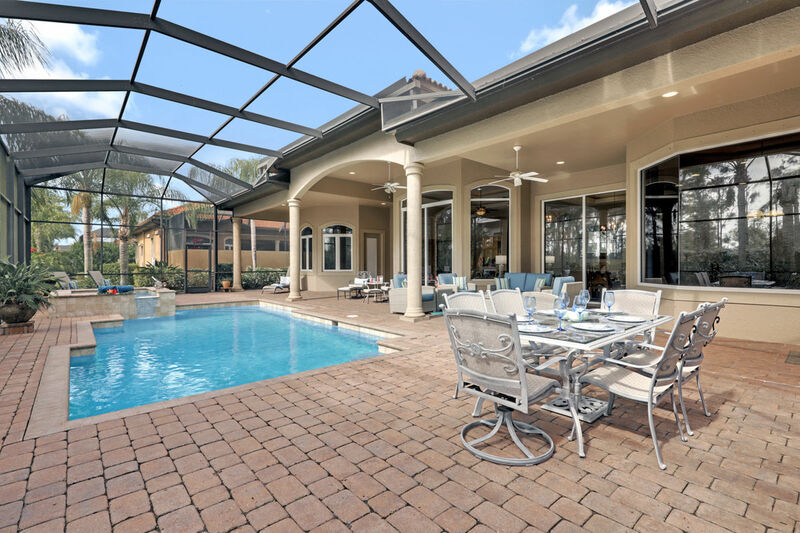 Lely Resort is a private golf course community with an optional transfer to have access to the world-class 20,000 sq. ft. Player's Club & Spa where you will find a lap pool & waterfall, children's water park, lighted tennis courts, bocce ball courts, a fitness center, a sauna, spa & massage services, theater room, restaurant, Tiki bar and poolside waiter service! You will also have access to some of the best golf courses Naples has to offer, the Mustang and Flamingo Island Golf courses. 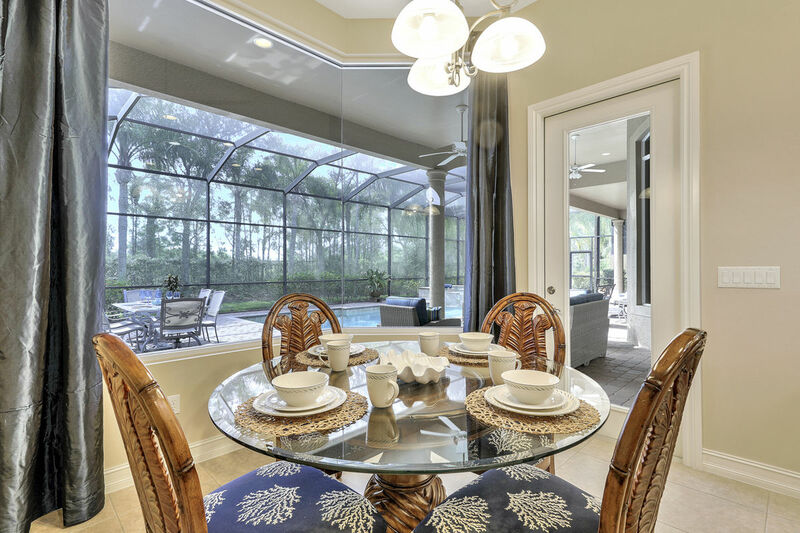 The home is about 18 minutes to downtown Naples, about 20 minutes to Marco Island. Naples itself is a world class destination drawing visitors from all over the world. 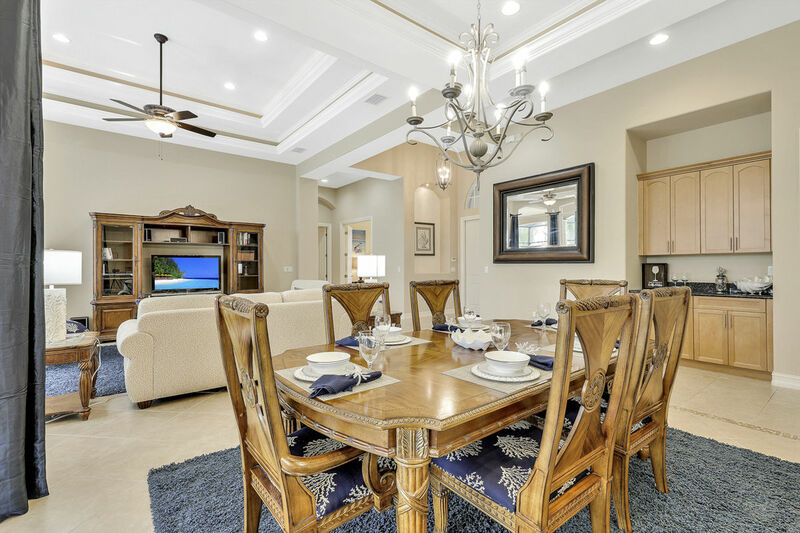 Gourmet dining, world class golf, fishing, quick access to the Everglades and Marco Island, charter boating, tennis, and incomparable Florida sun with the white sand of nearby Gulf Coast beaches. And shopping—some of the best in the country! Naples truly has something for everyone – from cosmopolitan to remote and quiet. 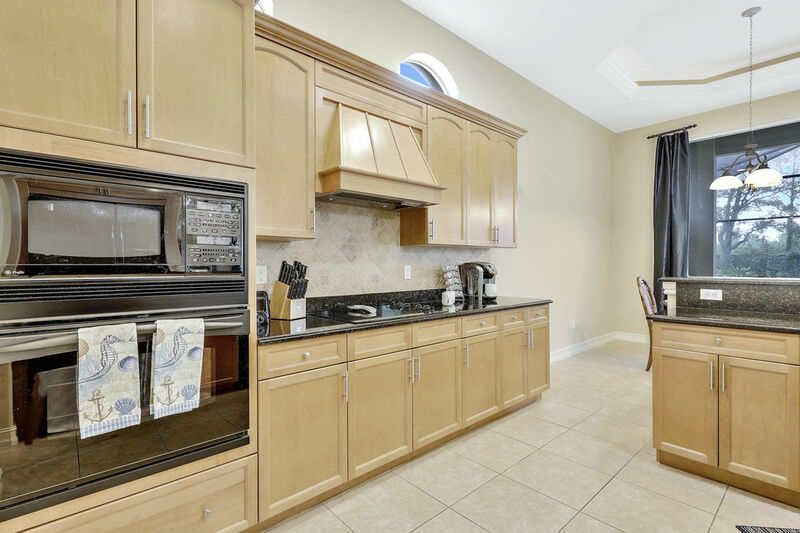 Please reach out to our office to book this beautiful and rare Majors home for your vacation! The home is immaculate, fully equipped, in a quiet location, with a great pool area and lovely interior spaces. 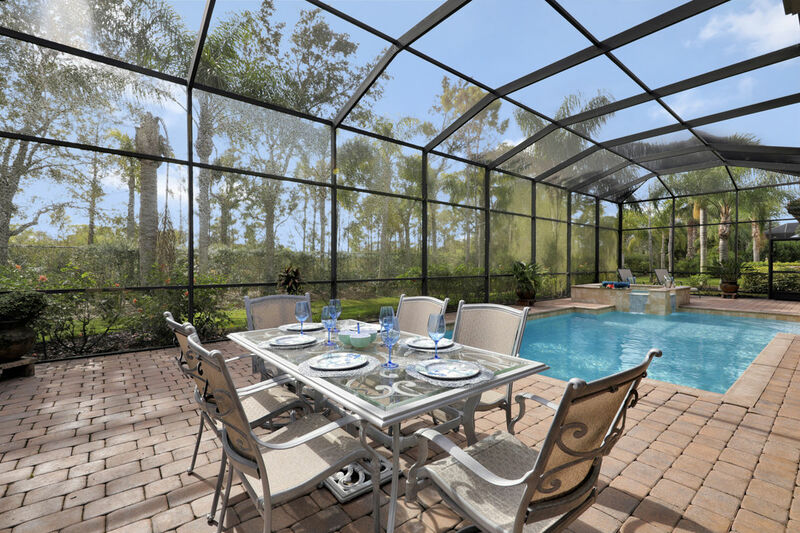 Everything is in excellent condition, the area is beautifully planted, and access to Naples and the surrounding area is easy. This is a place to return to again and again. The great tv system is a nice plus. Kudos to the owners.